The Pharmaceutical Manufacturers Group of the Manufacturers Association of Nigeria (PMG-MAN) has reiterated pleas for an adjustment tax of 20 percent to be immediately imposed on imported finished pharmaceutical products as it applies to other sectors where Nigeria has capacity as allowed by the Common External Tariff (CET). Also, under the National List within the CET, the group proposed that input into pharmaceutical manufacturing (raw materials, excipients and packaging) should be allowed to be imported at zero per cent by bonafide pharmaceutical manufacturers. 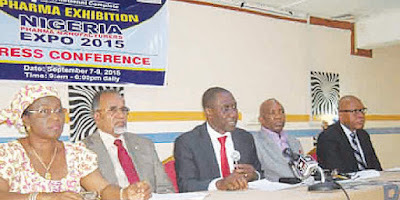 Chairman of PMG-MAN, Mr. Okey Akpa made the call on Tuesday, while announcing the 4th Pharma Manufacturers EXPO 2015 which will be taking place at The Haven, Oba Akinjobi Street, GRA, Ikeja, Lagos from September 7 to 9. Over 120 exhibitors are expected from France, Germany, India and other countries to the EXPO with the theme: Nigerian Pharmaceutical Industry and International Competitiveness. 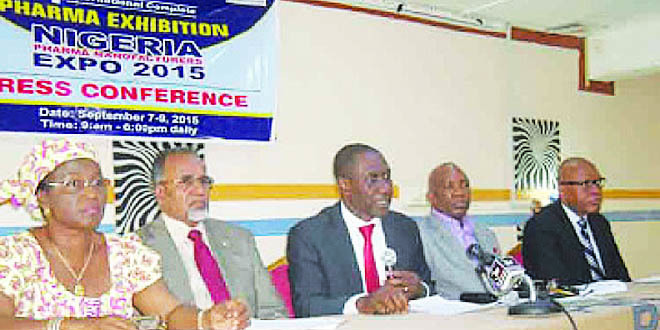 herald the 4th Pharma Manufacturers EXPO 2015, held in Ikeja, Lagos on Tuesday. The Nigeria Pharma Manufacturers Expo 2015 as usual presents a unique opportunity for stakeholders in the health sector as well as related industries, food, beverages, toiletries and cosmetics to exchange information, products, services and ideas. The EXPO will be a platform for new business opportunities, exposure to new formulations, latest machinery and equipment as well as serve as a catalyst for technology transfer. Over 3,000 participants and guests especially healthcare professionals from Nigeria and ECOWAS countries will be attending the forum. In addition, Akpa said relevant ministries, departments and agencies of government such as the Federal Ministry of Health (FMOH), Federal Ministry of Industry, Trade & Investment, National Agency for Food and Drug Administration and Control (NAFDAC), Standards Organisation of Nigeria (SON), Pharmacists Council of Nigeria (PCN) and the Bank of Industry (BOI) are expected to participate. While lamenting on the grave implication of Common External Tariff (CET) to the pharmaceutical industry, he stressed the need to protect the local pharmaceutical manufacturers and encourage industrialization as self-sufficiency in essential medicines has national security implications. He further warned that unless there is urgent intervention, the CET will lead to over a million job cuts in the Nigerian pharmaceutical industry. The PMG- MAN boss also noted the responsibility of government to cushion the effect of diseases on the economic, social and political stability of the country cannot be shifted on imported medicines. Akpa said: “We hereby re-iterate the need to protect the local pharmaceutical manufacturers and encourage industrialization as self-sufficiency in essential medicines has national security implications. He therefore recommended for an import adjustment tax of 20 per cent on imported finished pharmaceutical products of HS Codes 3003 & 3004 should be imposed immediately as applied to other sectors where Nigeria has capacity as allowed by the CET. In addition, under the National List within the CET, input into pharmaceutical Manufacturing (Raw materials, Excipients and packaging) should be allowed to be imported at zero per cent by bonafide Pharmaceutical Manufacturers. The PMG-MAN Chairman further said that it is collaborating with West African Pharmaceutical Manufacturers Association (WAPMA), Word West Africa Health Organization (WAHO) adding that the ECOWAS Commission is organizing a special forum on the impact of ECOWAS Common External Tariff on Pharmaceutical Manufacturing in West Africa. He also announced that the forum will hold September 10, at the Westown Hotels, Ikeja, adding that the President, ECOWAS Commission, Dr. Kadre Desire Ouedraogo is expected to be the guest of honour at the forum. On his part, Managing Director, JAWA Group, V. Verghese, advised that Nigeria should follow the current world trend of diversification and inclusiveness rather than reversing to monopoly which will give rise to cartels and syndicates. He therefore condemned a situation where the MDDC will hijack the entire distribution network. Contributing, Nnamdi Okafor, Managing Director of May & Baker, warned that implementation of CET as it is will work against government’s present policy of industrialisation. He condemned the development whereby people are told not to pay tariffs on finished imported products whereas local producers are asked to pay tariffs on raw materials. The lack of demand for locally manufactured medicines as a result of cheap imports will lead to idle capacities and negatively impact previous investment in the sector worth over N300 billion naira. A weak local manufacturing sector will inevitably lead to an influx of cheap imported medicines of doubtful quality,” Okafor further cautioned.